This house has everything you've ever dreamed of, in amazing modern style to boot! The designers of this home perfected the in-home bar, cinema, gym, spa, and patio. The staples of all modern home also make their appearance, as bolder and more luxurious than you've ever imagined them. Here is the over-the-top home that will inspire you to add an ostentatious touch to your home. This space is rich with textures that sing of luxury. The carpet and the flooring both have unique patterns that contrast fantastically. The carpet and floor, like most of the room's elements, are also in rich brown and creme tones that create unity and sophistication in the space. Where many would design a contemporary living room with bright lights and open windows, these designers have chosen black lamp shades and cold curtains. The light still pours in, but creates a more romantic ambiance than is normally achieved in modern living rooms. 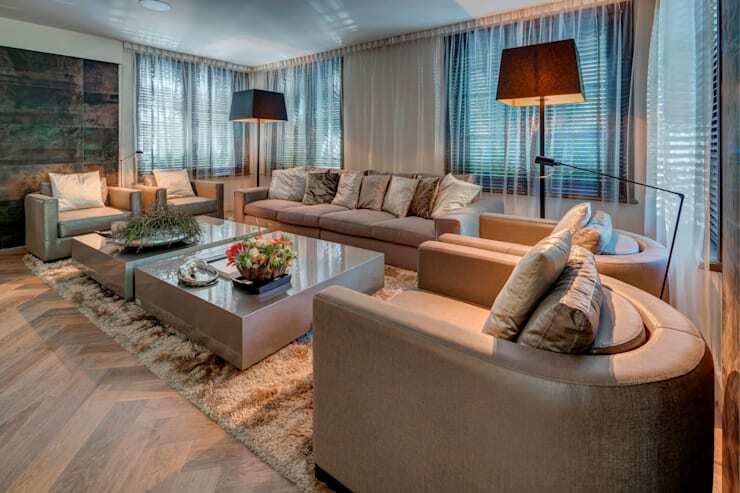 The dark art on the left side of the room further emphasizes this sophisticated feel. Is anything more dramatic than that eye-level chandelier? Instead of hanging over a table it floats over the floor, providing a romantic glow to the whole room. The black window dressing, and the chic bird-cage table capitalize on the dark themes that worked so well in the living room. The sitting room also has a fantastic carpet, in the form of a rustic leather pelt left unshaped. 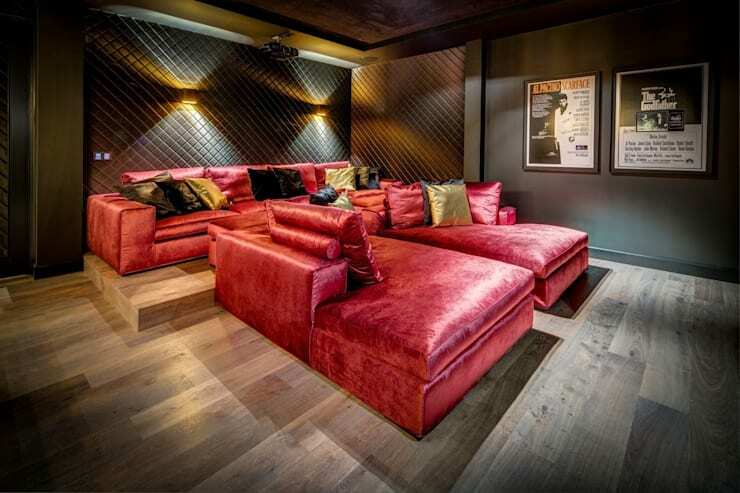 If you want a dramatic space to watch your favourite films with guests, this space is perfect. The dark walls make sense for movie viewing, and they're lit up with ostentatious features. The wall' checked texture looks phenomenal against the lights that radiate from the centre of the wall. So many of us imagine our home cinema's seating as the uncomfortable rows we see in the theatres. This home managed to create more intimacy with the space. Those large couches could seat a dozen but also seem plush. Elevating the back couch is a simple trick to allow everyone to see the screen. 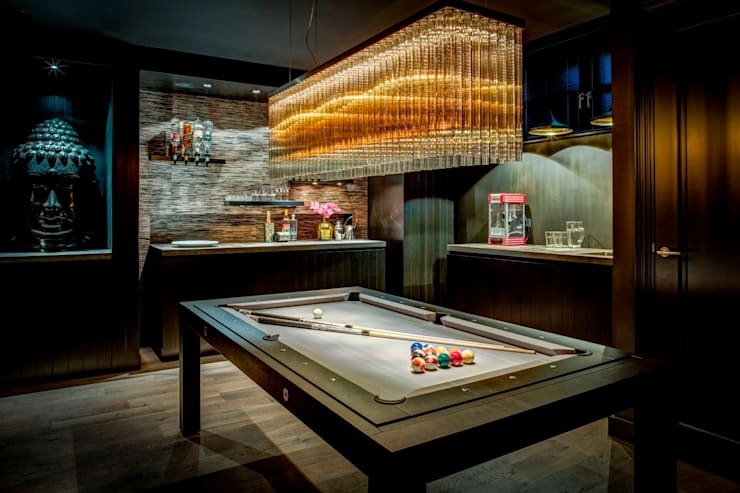 The interior designers made some amazing lighting choices for this home and they didn't forget the bar. That huge golden fixture feels simply opulent. Again, romantically dark wood has made this light even more splendid. With all of this darkness you might miss the huge sculpture on the left, but once you see that Buddhist-inspired head you'll fawn over the grand tone it lends to the space. The bar is a show-stopper too, with its finely grained back-splash and contemporary pot-lights. It has room for any kind of beverage your guests could desire and floating shelves to show off your collection. 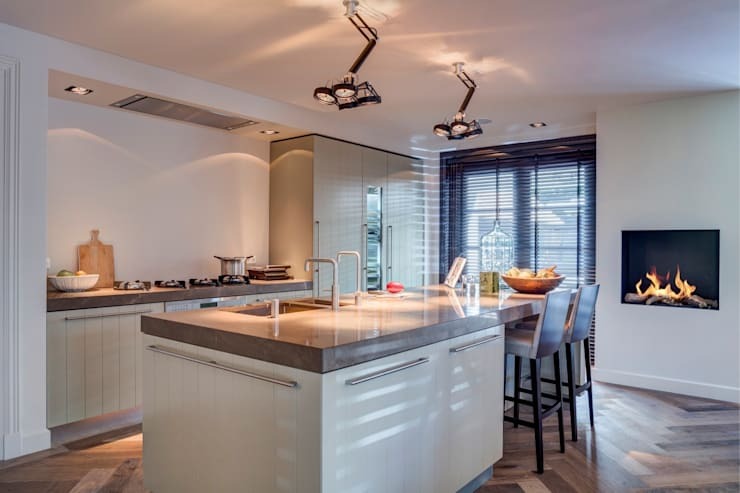 Looking for some extravagant lighting for your own home? 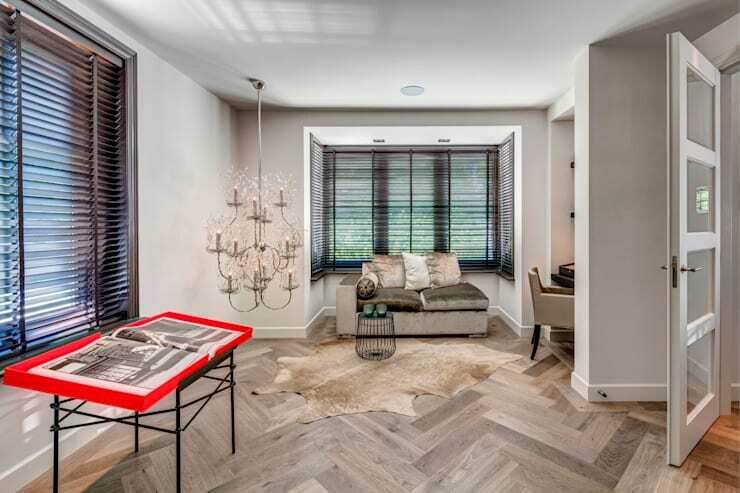 At homify we have tons to choose from, all right here. Those looking to sit in the lap of luxury will love this kitchen. It's eat-in dining is next to a fabulously modern fireplace. The adjustable lighting fixtures are practical and vibrant. The empty space above the stove element may seem bare to some, but it matches the fireplace and provides a clean symmetry to the room that feels bright and clutter-free. To the left is the huge gym, that doesn't skimp on style with the elegant brick wall in black and gray. To the far right is ample shelving for towels and gym accessories. 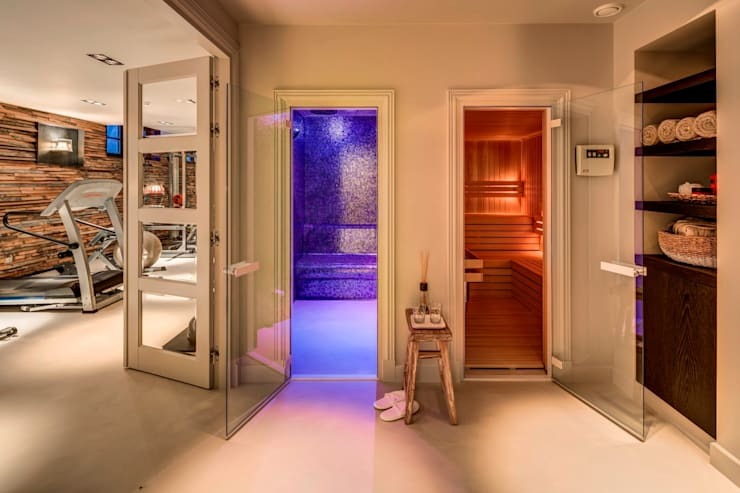 The center has everything you'd want at a spa, with a sauna, spa, a tiny rustic drink table and, of course, white slippers. What more could you ask for? This space would certainly be one of our favourite spots to lounge in this home. 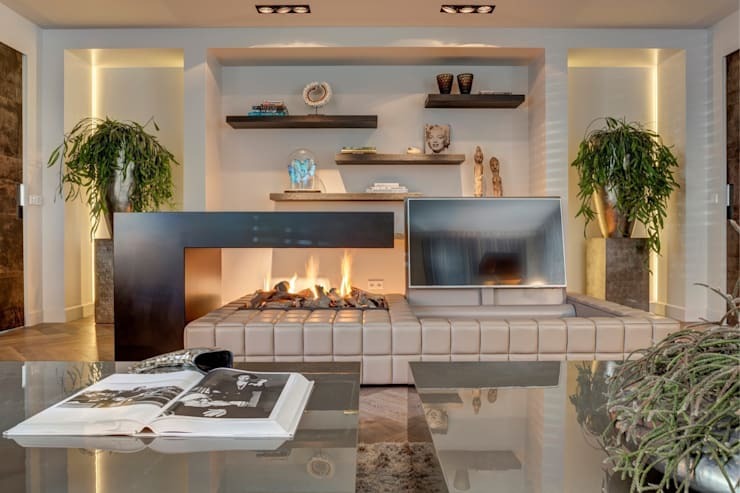 It's fireplace is alluring and dramatically contemporary. Again, the designers have contrasted dark with light by installing that delightful overhang above the flames. There's also some more floating shelves in this room, where the residents have put some art on display. If this dramatic home has filled you with envy, you'll be just as jealous over this majestic home.